Q: Who are you and what is SCTP? A: Hello there. I’m Sinitar, nice to meet ya. You may know me as an author of Skyrim/Oblivion and some other modding guides and author at this YT channel. Skyrim Community Texture Project is a definitive texture mod that containts huge amount of HQ textures and meshes, using assets from many popular mods from talented authors, with their permission – with minor tweaks/adjustments here and there. In many cases cases, I’ve optimized/retextured certain textures so they would fit the general look of the mod better, save some VRAM without noticable quality loss, look same good with both saturated/desaturated ENBs and so on. I was doing this during last 2 years for personal modded setup, but now I just realized I can ask for authors permissions and share this result of my work with their assets, to the community. Installing SCTP and using Rudy ENB, you will make your game look very similar to what you may see in my videos (which is really popular question at my modding guide page and YT channel). A: Yes! I have the highest respect to mod authors – without their work, our modded games would never be same amazing as we have them now. Each asset that was used to create SCTP was used only after I received direct permission from it’s author. Authors who did not give their permission should not be disturbed – please, respect their opinion same as I do and just get their mods yourself. Remember that all mods are given to us for free, and it’s our privilege, not something we can demand. Full list of mod authors contributed can be found below. Q: How exactly SCTP is made and what is the sense of it? A: I love the modding community. The day I discovered Nexus and all those amazing mods literally changed my life. I always seek one more way to say “thanks” to it. SCTP is a result of many dozens of hours me going through process or comparing, matching, adjusting, recompressing and in some cases trying to improve/retextures the textures, in the way they all will look good together. It’s a mod that can be used on top of all popular texture mods. I’ve also made 1024 and 512 versions of the mod for owners of low end/potato rigs. The core of SCTP is built from amazing Pfuscher’s assets from his generous permission with many other textures/meshes on top. SCTP covers huge amount of ingame objects and so it will save your time for seeking for dozens and maybe even hundreds mods and fill plenty of “gaps”, retexturing huge amount of common objects as well many that were never covered by popular mods before, or covered by small mods that are easy to miss because of their low endorsements amount. I did SCTP with the same dedication I’d do it for myself as player, in first turn. Q: What SCTP covers, exactly? A: A very, very, very lot – more than thousand of objects, and in general, more than half of your visual experience in game. – Rocks, stones & mountains. – Super-badass 4k dragonbone armor! – Improved road textures from amazing Blended Roads mod (optional) – I’m sorry I forgot to include these files in intial release, will add soon. Additionally, I’ve optimized some textures (excluded redundant alpha channels, made proper compression to textures and normalmaps to reduce the VRAM usage without noticeable quality loss etc, downsized some texture for small objects with undeeded bug texture size), fixed “blue textures” bugs in some cases, made retexturing for others (for some textures to look more volumetric), adjusted the tone a bit (so certain textures would look same good with both saturated/desaturated ENBs) and so on. A: Video showcase and more than hundred of screenshots 🙂 Each screenshot title tells which textures are covered by SCTP on it. Please take into account that to show literally each and every object covered by SCTP in total…is just not physically possible 😀 But, the video and screenshots should give you an overall presentation. Also, make sure to go through all screenshots – that’s not like “all the best in the beginning” – all images are demonstarting this or that texture and will help you to get the vision of this mod better. Q: What SCTP does [not] cover? Q: What is the texture resolution? A: Mostly 2k. It’s the best balance between quality and VRAM usage for gameplay. Certain textures are in 4k resolution, but that’s done in a smart way – for places that consume much less VRAM (interiors, for example) or single-met objects. Until you’re not on Pentium Core 2 Duo with Intel HD GPU, SCTP will affect your fps not more or less than other texture mods in general. If you have not so strong rig – don’t worry, 1k version (LITE) is also available. For people on potatoes, 512 version (SUPERLITE, vanilla resolution – but still will look much better than vanilla textures) is available as well. If you want to maybe compress/resize files yourself – use Ordenator﻿ to downscale textures to whatever resolution you want. Also, these .ini files are recommended. Even if you’ll resize them to vanilla resolution, your game still will look much better. Just download SCTP using your mod manager, install and overwrite everything when asked. If you’ll be installing some other big texture mods after, simply do NOT overwrite SCTP. Yes, that simple! Some base recommended mods and amazing mod author works that are covering what SCTP doesn’t cover and which I’m humbly recommending you to use, will be linked below. Q: Are there any required mods? A: Only Unofficial Patch, SMIM and Ruins Clutter Improved. Optimized Vanilla Textures is highly recommended. But with 99% chance you have them anyway, right? 😉 But if not, make sure to install them [before] installing SCTP. Q: Are there any recommended mods to use together/install before SCTP? – Noble Skyrim or Skyrim HD or Skyland (will work fine over all 3, but I personally recommend Skyrim HD as this mod is a base of my own setup, or you can isntall Noble/Skyland and overwrite with Skyrim HD) – install [BEFORE] SCTP. If installed after – do [NOT] overwrite SCTP. – Skyrim 2017 Terrain Parallax Textures – some texture will be crossing – overwriting is up to you. A: Yes! But you need to understand that this mod is huge. Some assets in it are only available for for LE, so adjusting them for SE (porting meshes, tweaking normalmaps etc) will take some time. Q: How big it is, unpacked? Q: My connection is bad/I don’t want whole mod and want only separate modules, can I have this? A: Yep! Go to Files tab – besides AIO mod, there are smaller files with certain texture/mesh types – landscapes, cities, clutter and so on. Q: Which authors assets were used to make SCTP? A: Atm, SCTP is built on assets of the next authors: Pfuscher, Rudy, Hein84, SRW0, ClearanceClarence, JDAnchor, AnTiWoMaAgNoT, Flash3113, cunny1975, Exalerion, Cuyima (Lyreha), ciathyza, MassiveMaster (Zhoulia), Rallyeator, cALAMIN, greenback12, T4gtr34um3r﻿. Additional thanks to Brumbek for making, compiling and supporting SMIM during all these years, and for his permission to use SMIM assets as long as he is credited. Please, go and show some love to them – endorse their mods,give them lovely kudos and consider about donating – even if it will be a small help, it will go a long way. SCTP would never appear without them! Q: Why donations are disabled? How to support? Q: I love the textures and I captured a few tasty screenshots! Q: What else can I use in addition to SCTP? 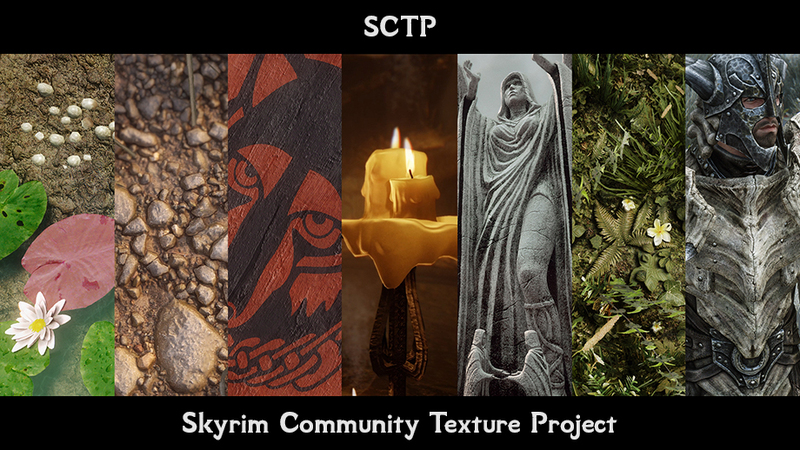 – SCTP uses textures from Rudy HQ Misc and Nordic Ruins mods – so if you’re using Rustic Silverware, Superior Silverware or Smoking Torches and Cancles – grab respective patches from Rudy HQ mod pages (only patches, nothing else needed). Overwrite if asked. – SCTP uses 2k textures from CC’s HQ Guard Shields – it covers vanilla game, so if you want support for Helgen Reborn and/or Falskaar, use CC’s original fomod version and install on top with chosen patches. 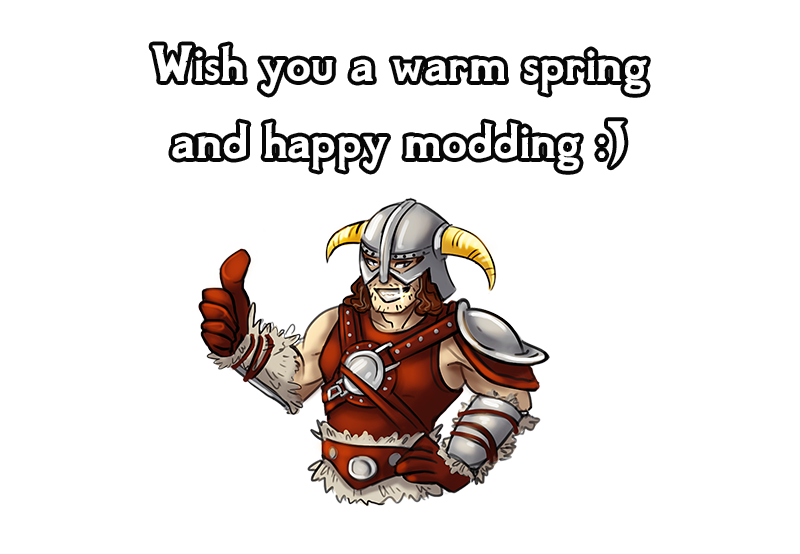 – SCTP uses default version of assets from Masks of Dovah Sonaak mod – if you want patches for some other mods, slitted eye meshes etc – proceed to the mod page itself, use it’s installer and overwrite SCTP. – If you don’t have Blended Roads, do NOT install my tweaked textures for Blended Roads, obviously. – Leanwolf’s Better-Shaped Weapons or similar mods that changes weapon meshes may have rare conflicts – overwrite or not depending on which mod’s model your prefer. I personally recommend to overwrite SCTP if that’s Better-Shaped Weapons.